"Jack Harvey, in The Barrier of Flames, which is featuring Helen Badgley and 'Shep,' Mr. Harvey's dog, had 'Shep' climb a ladder to the top of the roof on the house at the Stonberg place, Wednesday [September 23, 1914], while smoke pots made it appear that the house was in flames. It was a great stunt for a dog, and autos were lined up on lower Main Street while the occupants watched the movie in the making. Carl Gregory did the camera work with his tripod perched on the ridge-pole." "Shep, Thanhouser's collie, has recently been acclaimed by critics as a great dog actor. His work in motion pictures is a study in itself. The dog rehearses his parts and goes through them just like a regular actor and never grumbles or tries to sass back. When a scene was ready Director John Harvey, who handles Shep, walks all of the cast through their parts, and Shep never takes his eyes off the actors, with the result that Shep himself when his turn comes knows exactly the position of the actors and consequently is not bothered by them. 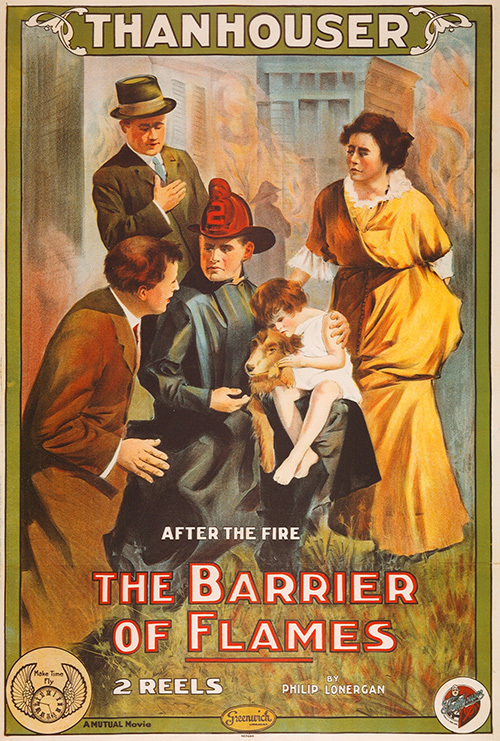 Recently in taking a picture, The Barrier of Flames, it was necessary for Shep to rescue Helen Badgley from a burning building. The house was set on fire, the fire department arrived and began work. Shep 'told' the firemen of the presence in the house of his little mistress. Before the firemen could prevent, Shep scurried up the ladder and led the firemen to Helen. Shep himself carried her to the window, where the willing hands of firemen gathered her into safety. "But they forgot all about Shep. Cut off by the flames, the dog was crouching in the window corner. Then the firemen spread a net and Shep made a leap to safety and into the arms of little Helen. One of the pictures shows this leap and another shows Director Harvey at work with the dog. Shep seems more willing to work with Helen Badgley than anyone else, although the Fairbanks twins, Madeline and Marion, come next in his affections. When Shep is at work he has no time for love pats from anyone. He stands close to Director Harvey, and at the first signal is immediately in his place. He is never told to do a thing twice. Director Harvey has a way of gently impressing upon Shep just the action desired and it is followed to the letter." "The mayor refuses to sign certain franchise bills which he believes to be dishonest, and when, unexpectedly, the political boss finds in his hands the means of coercing his superior, he determines to make the most of his opportunity. Little Helen, Mayor Southwick's child, straying away from an automobile party, gets lost in the woods. She comes to the house where the boss holds his secret conferences, and he orders his housekeeper to keep guard over the child while he motors to the city. His plan is to hold the child until her father has signed the bills. Meanwhile, the housekeeper wanders away to a neighbor's, leaving little Helen locked in an upper room. But the child's devoted collie, who misses her sorely, already is tracing her. Shep reaches the house just in time to rescue Helen. A fire has broken out while she is locked in alone. He alarms the firemen, climbs a ladder to Helen's room, and, jumping through a skylight, leads the rubber-coats to where the child is. With little Helen safe, Shep leaps from the top story of the burning house into the fire net." "A little child is saved from a fire by her devoted collie. Having rescued her he jumps from the roof of the burning building into a fire net." "The big feature of this two-reel picture is not the story, but the incidents and especially the work of Shep, a collie, that acts in an astonishingly intelligent way and is the center of both excitement and pathos. He is the means of bringing the rescue to the Kidlet, shut up in a burning house - very well handled scenes. It is the picture in which Shep jumps out of the second story window into a fire net. The best scenes in the picture are worthy of a better story; but the offering is one that will make an especially strong appeal to all kinds of audiences. The direction is by John Harvey." "There is a story involving a dauntless mayor threatened by the political boss if he does not sign a graft franchise. It is told as gravely as if the main issue was that of individual principle in heroic resistance to organize political corruption, such has been the theme of many a photoplay, but the real story is that of Baby Helen and Shep, and these two present a spectacle of intelligent performance that has a charm lacking in the 'acting' of natural human beings. The baby girl does her part with more spontaneity than usual, that is, without obvious prompting, and from all appearances, she is far from being a nervous child. Shep cannot help showing that he is responding to instructions - all dogs do that - they have not learned to pretend to more than a very limited degree. Shep does well, nevertheless, playing his part with most intelligence in the trying scenes. "The mayor refuses to put a signature upon a grant, made by aldermanic crooks, and the political gang menaces him with vengeance. That vengeance takes a form that any politician familiar with the criminal code would hesitate to use. Baby Helen wanders from her natural protectors in chase of a white rabbit, and loses her way. She is in the neighborhood of the political leader's house and is found by his maid at a moment when there is conference in session. When the baby is brought in and recognized as the mayor's child, it is agreed to hold her as hostage until the mayor, under pressure, is brought to grant the desired franchise. Inasmuch as such a threat would involve the grafters more seriously than merely stealing the people's property, it is hard to swallow. "A political leader hears that his own house is on fire while he is visiting the mayor and both speed to the rescue - that ends their performance. Shep, meanwhile, like a good motion picture dog, has traced Helen to the political leader's house, and, noticing, as others do not, that it is on fire, he speeds to the engine house and convinces the fireman in dog language that their services are needed. He outstrips the engines, reaches the burning house, climbs a ladder to the roof, makes his way to baby Helen's room, and barks out of the window his instructions for firemen to put up a rescue ladder. They do so, and one gallant fireman carries baby Helen down in safety. But what of poor Shep? Will he be destroyed in the flames? The firemen spread a net, and Shep barks that he understands. He balances on the window ledge amid intense excitement, and leaps to safety. What became of the blackmailing, kidnaping gang of politicians is left to the imagination. They are probably with us yet." REVIEW by Elizabeth Lonergan, The New York Star, December 23, 1914: This review is reprinted in the narrative section of the present work.